Controls: WASD or arrows to move. Click to shoot. Mouse to aim! 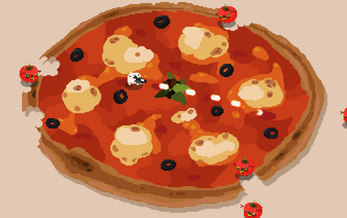 You play as a piece of mozarella with a machinegun, on a pizza. Zombie ingredients come towards the pizza and start noming on it shrinking the pizza. You can only walk on pizza so you need to defend it. 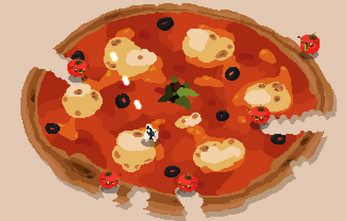 If the pizza gets too small, you will have no are to move on, and you will most certainly get eaten. You win after a certan amount of waves. If a zombie that does not eat pizza gets to the Basilic Braga(basilics name.. Don’t ask), you lose. score of 850 :))) i'm way too proud. Cute idea, but not very engaging gameplay right now. 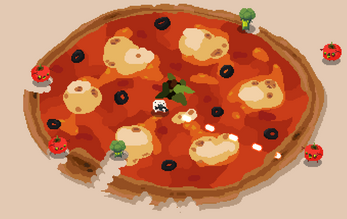 Gets repetitive fast and I had to actively try to lose for the game to end (very easy to defend when only a small bit of pizza remains). Holding down the button becomes painful after a while and there seems to be no reason to let it go - maybe the gun should fire automatically? Encountered a small graphics glitch where a projectile graphic got stuck near the middle of the screen - not sure how I did that.